I really love Pottery Barn's style, but I really don't love their prices. A sweet little table in the Addition for my girls to scatter their crayons on and fight over Polly Pockets share some special moments. I was very patient, and one day I stumbled across perfection at Salvation Army's "Make a Deal Saturday." Well, I know it doesn't look like perfection here, but I had a plan! I haggled the manager down to $10 for the whole set and managed to fit it in the back of my Trailblazer along with a double stroller. Yeah, okay, it was pretty bad. I started by cleaning it and slathering about 5 coats of primer on top. That dark stuff is hard to cover up! Then the set received several coats of the white paint that we used on the trim and baseboards in the Addition. Already had it on hand, so it was FREE! My friend Andrea (the sewing guru who helped me with my other Salvation Army furniture makeover) helped me measure and cut new foam and fabric for the cushions because, y'all, those things were nasty!! Orangey old moldy corduroy that was way past its prime. I think the clients were pleased! Linking to Kimba's weekly DIY Day and Holly's Pottery Barn Knock-Off Party over at Homebody. GREAT job, Miss Amanda! It looks just perfect. Yours is better because look at those little angelic clients sitting there! It's probably a sturdy old thing that you brought back to life. 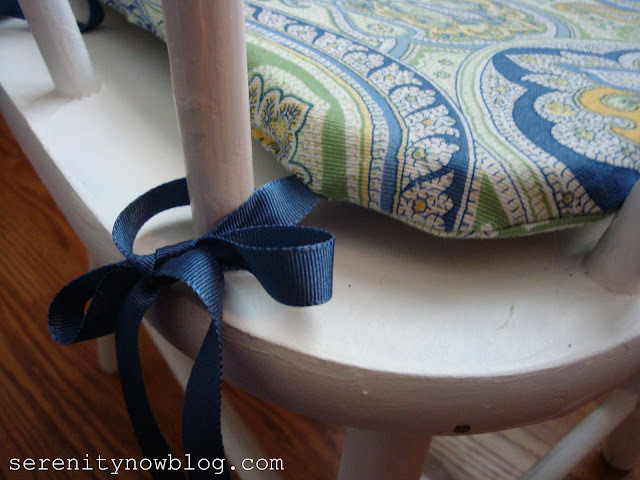 Love the fabric on the seat cushions. Great job!! I love the white paint and the cute fabric you used for the cushions. Your girls are going to have so much fun using this cute set. A++++ project!! Great Job Amanda!!! I love it. Wow, you sure did score with those pieces! $10. wow. Why can't I ever get deals like that? I think the project came out great. I love PB too and I too don't like the prices. I love seeing everyone's knock off versions. Way to go! So super cute, and your girls will get so much use out of it! My daughter is 7 and is still using hers. Great price tag too! Oh my gosh you did such a great job, it turned out so cute! It's so cute! I love the fabric you picked for the cusions! What a great find! 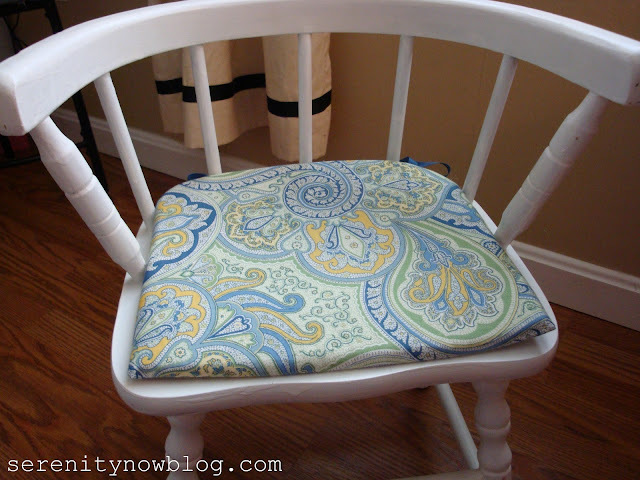 That is too cute and being the fabric junkie that I am, I am lovin' the blue/green paisley! TOO CUTE! I can't wait 'til Wednesday! I have another dilemma! You did an AMAZING job!! I adore the chair pads!! Amanda! Your blog looks GREAT! And it loaded in no time flat--no problems at all! And just look at that darling psychedelic butterfly--that is fun and pretty. Good for you! So cool! The entire set turned out adorable. Amazing what some paint, cute fabric, and some elbow grease will do for ya! i LOVE the updated page look. so chic. oh my gosh it turned out SOOO cute! and "make a deal saturday" sounds like my idea of heaven!! AWWW!! This is so cute! 10 times better than Pottery Barn. I think it looks amazing - well worth all the primer it took. I epecially love that beautiful fabric you used! What a fantastic second life for this little set! I know it's going to get lots of use in your house, and I LOVE the fabric you chose. Great job! Love it! It looks better that the Pottery Barn one! SO cute! I actually like it better than the PB table. It has more character and such a whimsical quality! It looks great! I really love the little cushions. Such a great fabric. And the girls look very pleased too. Very cute, fresh, and fun! Amazing makeover! The white really updated them, and I love the cushions. The fabric is adorable, and I love the ribbon ties. Thanks for sharing! It's amazing what a coat of white paint will do! I have two small table sets for my daughter and I have been debating on the color. I think I know what to do. Thanks for the inspiration! The table looks fantastic. What a great little table for the kids to enjoy. Oh, I love your new design! SO adorable! What a great place for them to play!!! I have to tell you... I think your set is even BETTER than the Pottery Barn version! You did a great job and I LOVE the barrel back chairs. You have a the CUTEST little girls! Thanks for your Blog! Very fum=n!!! you did an awsome job!! Seriously swooning with your white painted set and fabric choice. LOVE with pink puffy hearts this transformation. Gorgeous !!! totally drooling over that fabric! what an awesome playset! So stinkin' adorable! I'm totally in love with it! so sweet! im sure they are totally thrilled! So cute! I love the paisley seat cushions too. Adorable! I LOVE the cushions. Fab job. Wow! Love this! Now I'll be on the hunt for a little table and chairs set for my niece! Who knew you could bargain at the Salvation Army?! The set is lovely. I especially love the fabric you used on the cushions. OMG I have the same table set -it's a hand me down from my Mom's friend. I have got to paint it now! It looks WONDERFUL!!! Great job!! Love the makeover. You captured the spirit and made it your own. I love the fabric you chose for the cushions and I also love your chairs more than the PB ones. 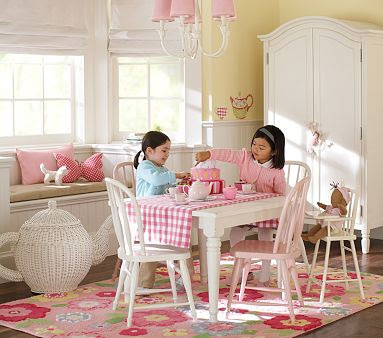 I'm sure your littles are loving their new table and chairs. Hi Amanda, thanks for visiting my blog! I've been a lurker here before and especially like your Decorating Dilemmas Party (busy body me, couldn't resist giving your linkers my opinion!). 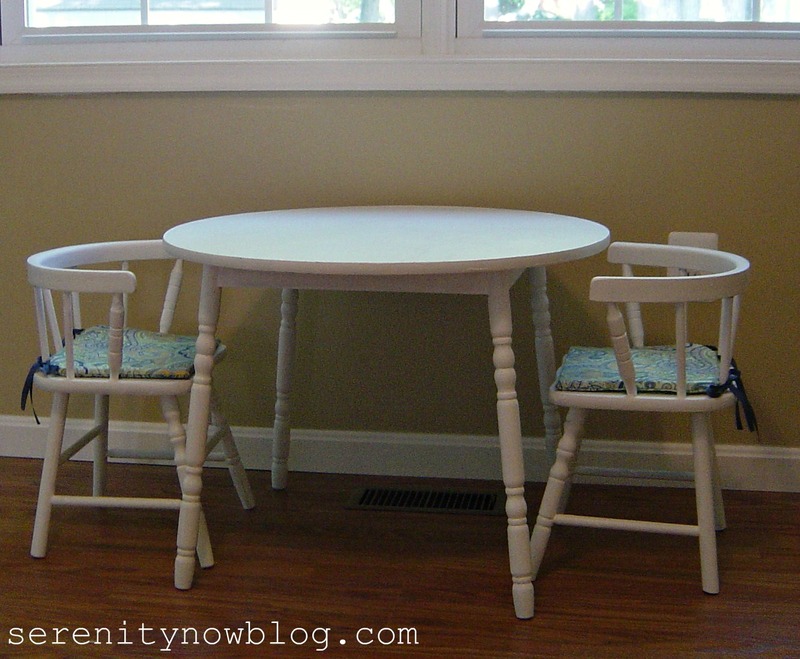 The table is cute - it's hard to find sturdy wooden sets. The girls look happy, break out the Pollys! Very cute and the girls look so pleased. You did good! And you will really make out better in the long run because they don't make furniture like they used to. Great Job and Great Price! Love it!! Okay, I was sure I commented on this last week, but maybe it was an email I sent you! Anyway, you know I think this is fabulous! It looks like a million bucks! I can't believe that set was only $10. It is fabulous! Oh-So-Cute! I especially love the fabric on the chair cushions. And the "clients" do indeed look VERY happy. Great job! Wow, that looks great--better than PB!! That is adorable, and so are your girls! Great job!